Bruno walks along the length of the fence for a long time. It feels as if the fence is several miles long, and he continues to follow it until his house becomes so far away he can no longer see it. Despite his lengthy exploration, he sees no entrance or exit to the camp on the other side of the fence. Just when he is starting to feel a little hungry, and wonders if perhaps it is time to turn around, he sees a small dot in the distance. He wonders if perhaps it is a mirage, a phenomenon which he once read about. As Bruno gets closer, however, he realizes the dot is a boy. When the two boys finally reach each other, they say “Hello” to one another. Bruno notices that the boy is wearing the striped pajamas he has seen all of the people outside the window wearing, including a striped cap cloth on his head. The boy is not wearing any socks or shoes, and he seems very forlorn and dirty. On his arm, he wears an armband with a star on it. His face seems almost grey, and his eyes are very large and sad. Bruno thinks that he has never seen such a skinny boy in his entire life. The boy is in his concentration camp uniform (which Bruno still somehow thinks are pajamas), and bears the Star of David to brand him as a Jew. His eyes seem wide and large because he is severely malnourished, as the people in the camp are kept in starvation conditions. Boyne is stretching the truth here with the very existence of the boy, however—at Auschwitz, children too young to work were immediately killed. The fact that Bruno and Shmuel have the same birthdate, but live wildly different lives, underscores the horrors of the Holocaust and the anti-Semitic ideology of the Nazi party. Though Shmuel is a (relatively) innocent nine-year-old boy just like Bruno, he is imprisoned while Bruno is not, simply because he is a Jew. The “moral” of the story, which Boyne makes clear from this first scene with the matching birthdays, is just how similar Shmuel and Bruno are in essence—they are separated by class, nationality, and religion, but as human beings they are equal. Bruno asks Shmuel if he has any friends, and Shmuel says sort of—there are a lot of boys on his side of the fence, but they fight a lot. This is why he has come to the fence, to be alone. Bruno complains that he is bored on his own side of the fence with no one to play with, and thinks it unfair that Shmuel has so many companions. He tells Shmuel that he is from Berlin, and is shocked when Shmuel does not know where Berlin is. Shmuel explains that he is from Poland, and Bruno is surprised, since Shmuel has been speaking to him in German. Shmuel explains that he responded in German when Bruno said “hello” to him in that language. He says that his mother is a schoolteacher who taught him the language. This moment shows how little Bruno still knows about the situation at Auschwitz—though the camp is located in Poland, Bruno had no idea that he had even left Germany. 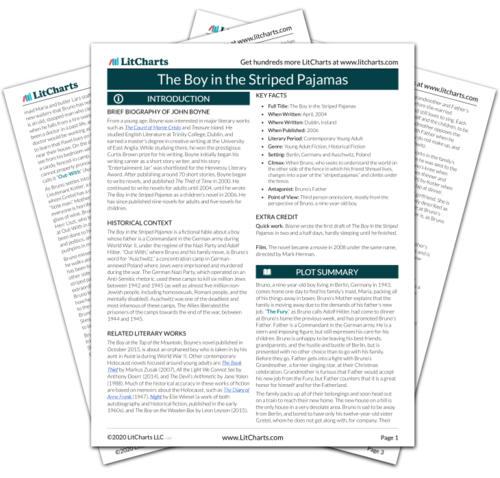 Though the two boys are the same age, Shmuel is already world-weary after being ripped from his home and imprisoned in the concentration camp. We are again reminded that everyone in the story is supposed to be speaking German, so Bruno’s mispronunciations of “Fury” and “Out-With” are another stretch of reality. Bruno tells Shmuel that he does not think Poland is as good a country as Germany, and Shmuel asks him why he thinks that. Bruno explains that “Germany is the greatest of all countries,” and parrots what he has heard Father and Grandfather say, which is that they are “superior.” Shmuel just stares at him, unsure what to say. Uncomfortable, Bruno asks Shmuel where Poland is. Shmuel says that it is in Europe, and Bruno theorizes that Poland is in Denmark. Shmuel stares at him, and states that they are in Poland right now, and that Denmark is far away from both Poland and Germany. Bruno, confused, wishes to change the subject, because he realizes that he is very wrong about a lot of his ideas on geography. Though Bruno consciously understands very little about the war, he has been indoctrinated since birth to believe that Germany is a superior nation to all other nations. He repeats this rhetoric without even thinking, and Shmuel’s simple question makes him, for the first time in his life, question what he has been taught. Shmuel seems just as incredulous as we might be that Bruno remains so ignorant and naïve, despite his situation. Bruno tells Shmuel that if they are in Poland, this is the first time he has been in the country. Shmuel says that he has never been to Berlin either, and that this part of Poland is not as nice as the part that he is from. Bruno tells Shmuel that Berlin is bustling with fruit and vegetable carts and lots of people, but that right before they left, they had to follow a nighttime curfew, and that things became noisy after dark. Shmuel says that where he is from is much nicer than Berlin. He says that the people there are friendlier, and the food is better. Bruno states that the boys will have to agree to disagree, since he does not want to start a fight with his new friend. Shmuel counters that Poland is better than Berlin simply to stand up for himself in their first conversation. There is no room for any kind of argument with a German in the camp, and when Bruno proposes that the two agree to disagree, Shmuel sees that Bruno is different than the cruel soldiers he is used to. It’s made more clear that Bruno has experienced some of the consequences of the war, while still remaining totally unaware of its existence. Bruno’s ability to wander around as he pleases, compared to Shmuel’s confinement to the camp, continues to underscore the vast difference between Bruno’s life and Shmuel’s, despite their identical ages. Bruno’s question to Shmuel about the nature of the camp shows that despite his apparent ignorance, his intuition still tells him that there is something sinister afoot at Auschwitz. Munk, Olivia. "The Boy in the Striped Pajamas Chapter 10." LitCharts. LitCharts LLC, 20 Jan 2016. Web. 25 Apr 2019. Munk, Olivia. "The Boy in the Striped Pajamas Chapter 10." LitCharts LLC, January 20, 2016. 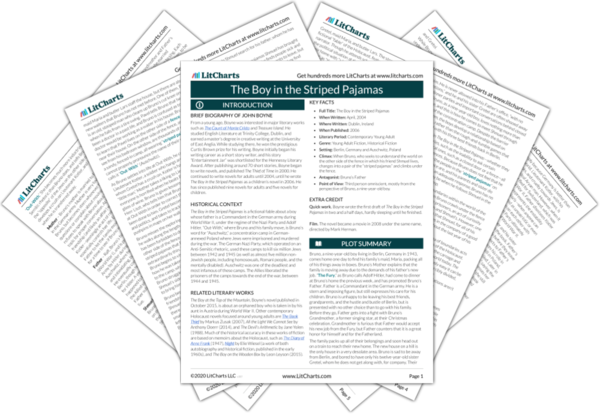 Retrieved April 25, 2019. https://www.litcharts.com/lit/the-boy-in-the-striped-pajamas/chapter-10.